There’s always some people who just go that little bit too far when it comes to the annual Christmas Photo. 10 – “All I Want For Christmas Is For You To F*** Off” – I thought all kids loved Christmas and Santa Claus? Well, apparently this little b***h doesn’t. 9 – “Merry Christmas Doll Face” – There are thousands of bad Christmas photos with people thinking that it is a good idea to pose with their pets, however, this dude takes it one step further and also has a plastic doll. Why? Well, I can only imagine the reason is that he is actually mental? 8 – “The Weather Is A Bit Nip-py” – If you do feel the need to get naked in a Christmas photo then at least make it funny! 7 – “The Nightmare Before Christmas” – This looks like the Holiday special for the movie – The Shining or Child’s Play – CREEPY! 6 – “Have You Been Good?” – Yes, yes! Please don’t kill me Mr Claus! 5 – “It Was A Wonderful Life…” As if it’s not bad enough that they’ve sent their grandma off to a nursing home they rub it in her face by making her look ridiculous! 3 – “Stop The Cavalry” – Some people don’t know when to stop, she’s about to give birth to another one of these creatures! 2 – “Ho Christmas Tree” – no one likes a show off! 1 – “Joy To The World” – just remember that not everyone likes Christmas! 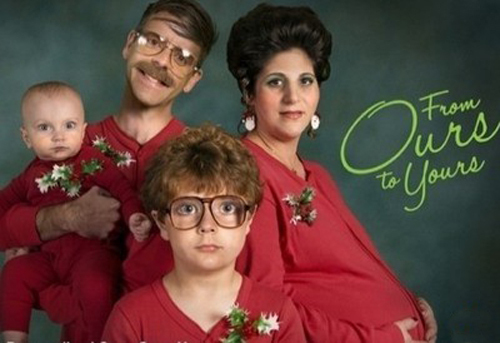 Do you have a favourite awkward Christmas photo? Do you have any Christmas fails you are brave enough to share? 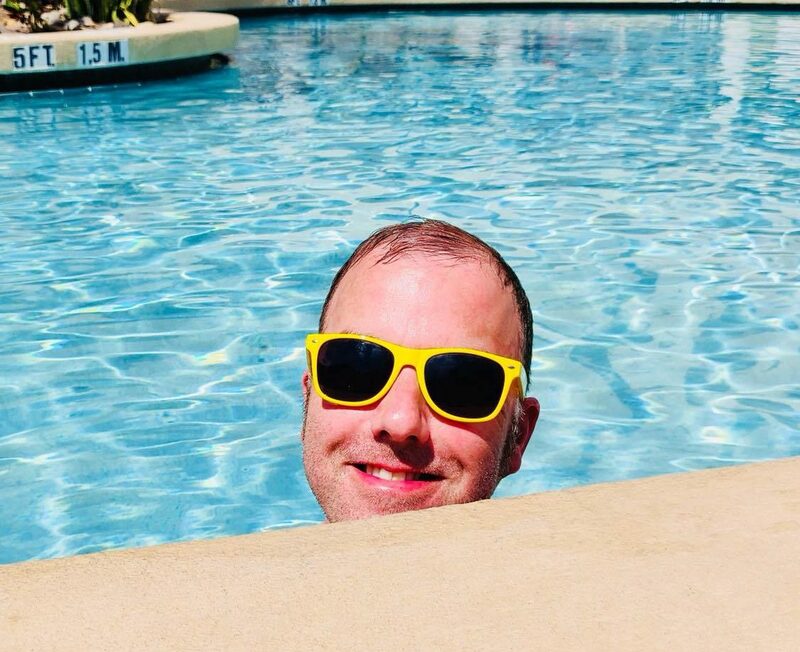 I’d love to hear about them so share them with me in the comments below or tweet me @MrMcSteveface. 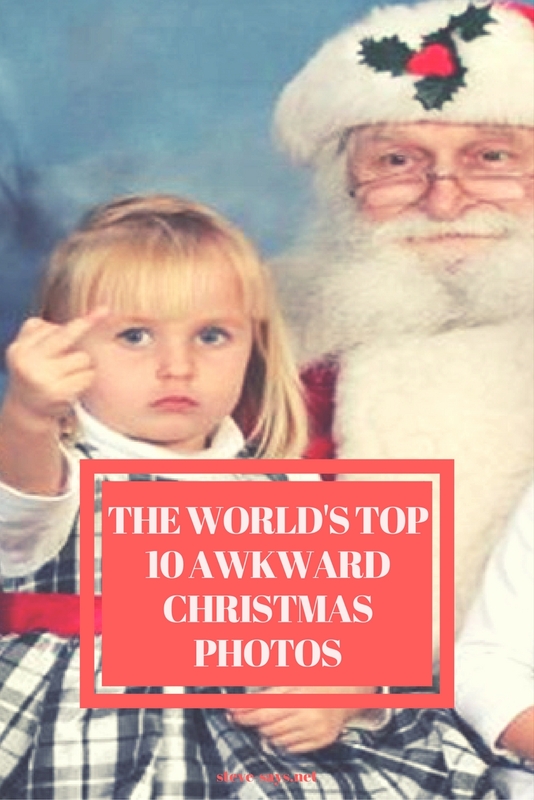 Come back soon for my 2016 Christmas Top Ten and in the meantime take a look at my other Awkward Photos Top Tens. As it is Christmas make sure you get your Ugly Christmas Sweater in time. Click the image below for the best range I have ever seen! Okay, that one was funny. I’m scared of what I might include for 2015! Crikey – you just can’t trust no one these days, not even Santa! No 1 – great knitwear. Haha totally. Christmas jumpers rock!